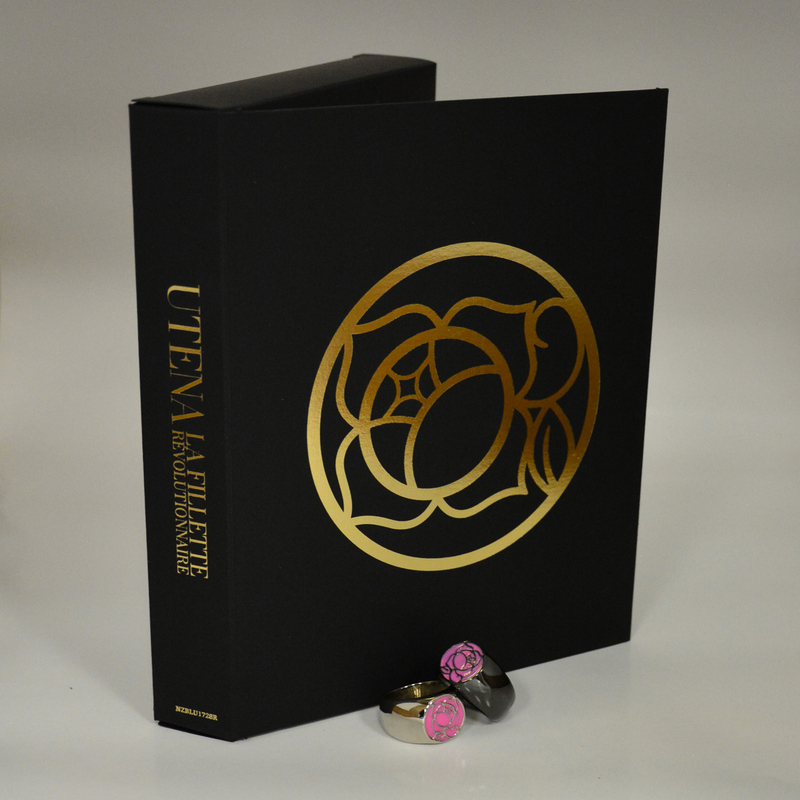 Revolutionary Girl Utena Ultra Collection contains episodes 1-39 + Movie in a special 20th Anniversary Edition box plus extras such as a replica Rose Crest Ring, a replica Black Rose Crest ring, and a 264 page limited edition art book with sliver foil numbering. "Never lose that strength or nobility, even when you grow up." When Utena was just a child and in the depths of sorrow, she found salvation in those words. They were the words of a prince, who wrapped her in his rosescented embrace and bestowed upon her both a ring and the promise that it would lead her to him again. She never forgot the encounter. In fact, she was so impressed that she aspired to be like the prince and also help those in need. Now a spirited teenager, Utena attends the prestigious Ohtori Academy. However, her strong sense of chivalry soon places her at odds with the school's student council and thrusts her into a series of mysterious and dangerous duels against its members. Special Features:Video extras include: clean opening and closings, live action video for opening single, TV spot for opening single, promos, trailers, animated art galleries, Japanese staff commentary for episodes 37-39, full-length movie commentary by Director Kunihiko Ikuhara, dueling themes karaoke, behind the scenes of the movie with the English cast, and interviews with Director Kunihiko Ikuhara, Tomoko Kawakami (“Utena”), Yuriko Fuchizaki (“Anthy”), and the English cast. This was definitely worth waiting for! 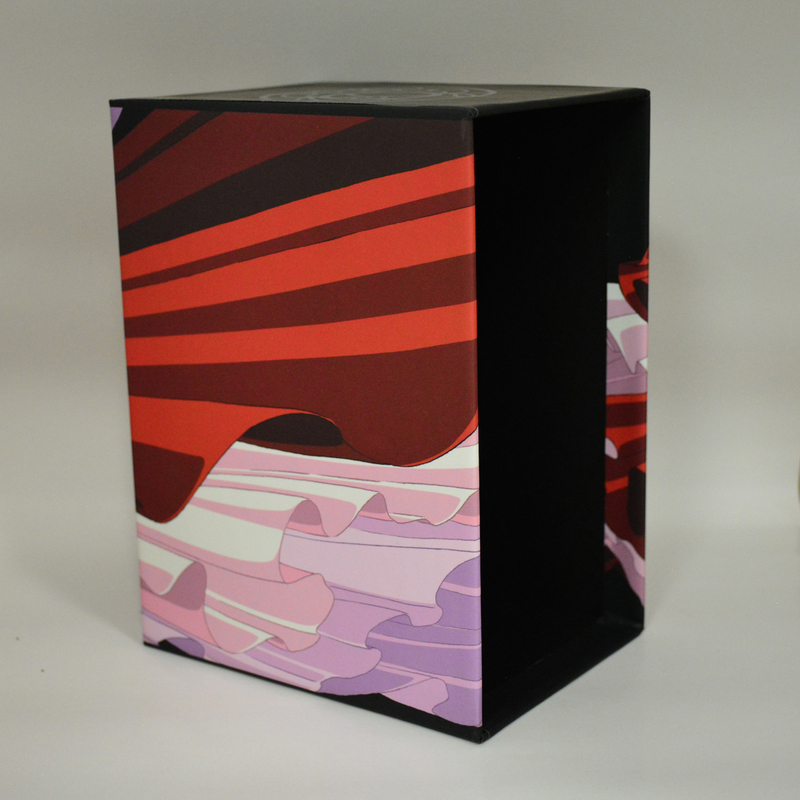 The inner and outer box use the new art created for the Japanese DVD box sets but in a better way. On the Japanese version, the art was a removable and easily damaged wrap around paper, this one is printed right on the soft-touch boxes. I also have the DVD box sets by Nozomi and out of the three versions this new one is the best presentation in every way. From the gold foil slip cover to how all extras fits inside the box with everything else. All the pages in the book are the same in the three previous box sets, I think but the hardcover is really nice. I definitely love a box set like this! Shoujo Kakumei Utena is a supreme work of human achievement on par with Wagner's Der Ring des Nibelungen. It is not "one of" the best anime series, it is THE best, period. But you should already know that. This review is about this particular, specific release. The actual footage appears to be genuinely remastered (ie not Viz's Sailor Moon!) There is some "noise" but it is to be expected; Utena was drawn on cells and shot on 16mm film in 1997, so it's not going to look like a modern, all-digital HD anime. The book features all of the material from the previous dvd releases, plus new stuff such as a discussion of the HD remastering and additional artwork. I have some concerns regarding the binding. The rings are very nice but no so amazing as to justify the whole set being delayed six months. The packaging is sturdy but the outer slipcase is little more than folded cardstock and I fear will not stand the test of time. In all, this set is worth getting even if you already have the DVDs. 10/10 woudl reccomend to any Utena fan! Once this set was announced I knew I had to have it! Revolutionary Girl Utena is gorgeously animated and absolutely iconic when it comes to breaking down shoujo tropes. This box set is absolutely stunning and probably my favorite set I won now. The art book is detailed and hardcover which was super cool. The rings included are of cosplay quality and really add to the fantasy of this set. I also have to give props to Right Stuf for keeping those who pre-ordered this set in the loop. At this price and for the quality that it is, it was definitely a set worth waiting for! Thanks for offering us a high quality solid material box. I'm in love with the beauty of this product and you seduced me with the two rings ! I should buy a free-zone Blu-ray reader to be able to read it so please international fans, take in consideration that you may not be able to read it unless if you have the correct equipment ! This is only a review of the packaging. The presentation is exceptionally well done. 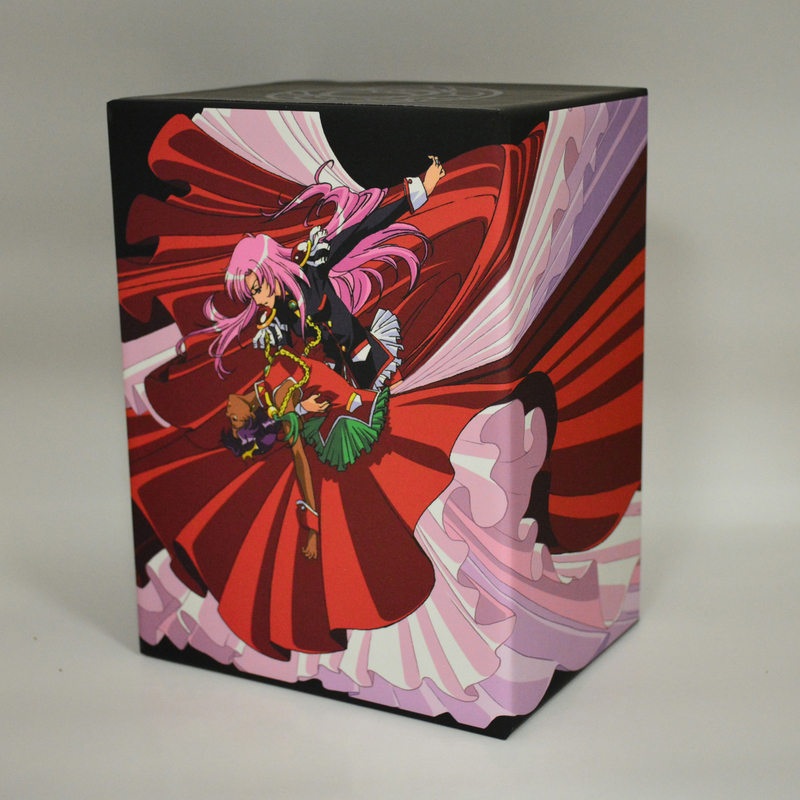 Once you slip off (and discard) the windowed outer sleeve, you'll see the image of Anthy and Utena wraps around the whole inner box, which is a substantial material soft to the touch. This time the disks and chapter cases are black instead of white (an improvement by my preference). It contains two rings, one dark, both more substantial than the ring I got from a DVD set years back. Also included is a hardcover artbook otherwise like others from previous sets. 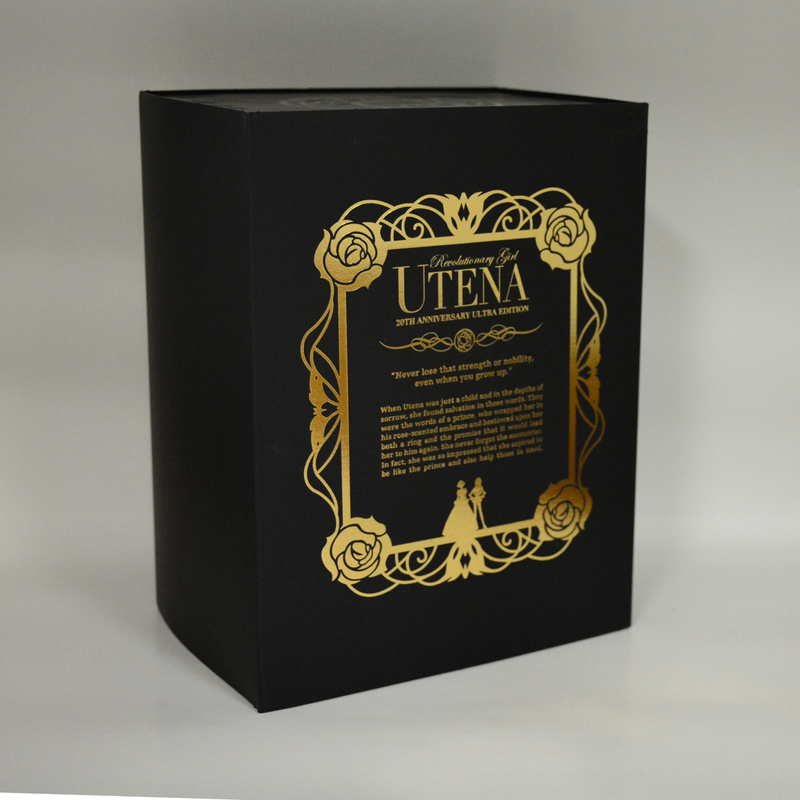 I didn't check if it contains new art (probably doesn't), but for those who don't have the previous artbooks for Utena, they're good to have. I admired one of the pages from my old set enough to paint a 3'x4' canvas in its image and want to do another. I've transferred all my other DVDs/blu-rays into a sorted storage bin and discarded their boxes. But this one I'm keeping on a shelf. I was blown away by the quality of this product. The design that went into the packaging is beautiful. It comes with the three blu-ray sets which are all remastered well. My favorite part of this is the hardcover book which contains commentary from director Kunihiko Ikuhara, the entire Japanese voice cast, and more. The final piece is the rose rings. I would definitely use these for cosplay. They're very sturdy. I was expecting these to be made out of plastic, but they're actually metallic. 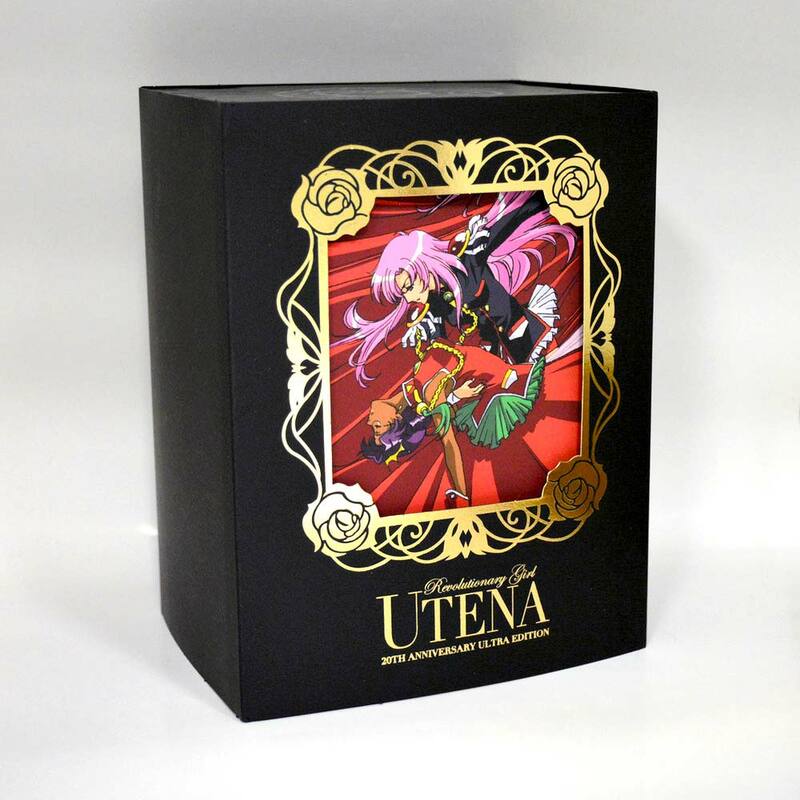 Utena Ultra Edition raises the bar for anime releases as it gives you more for your buck. I can't recommend it enough. I absolutely love this series and this edition is amazing. 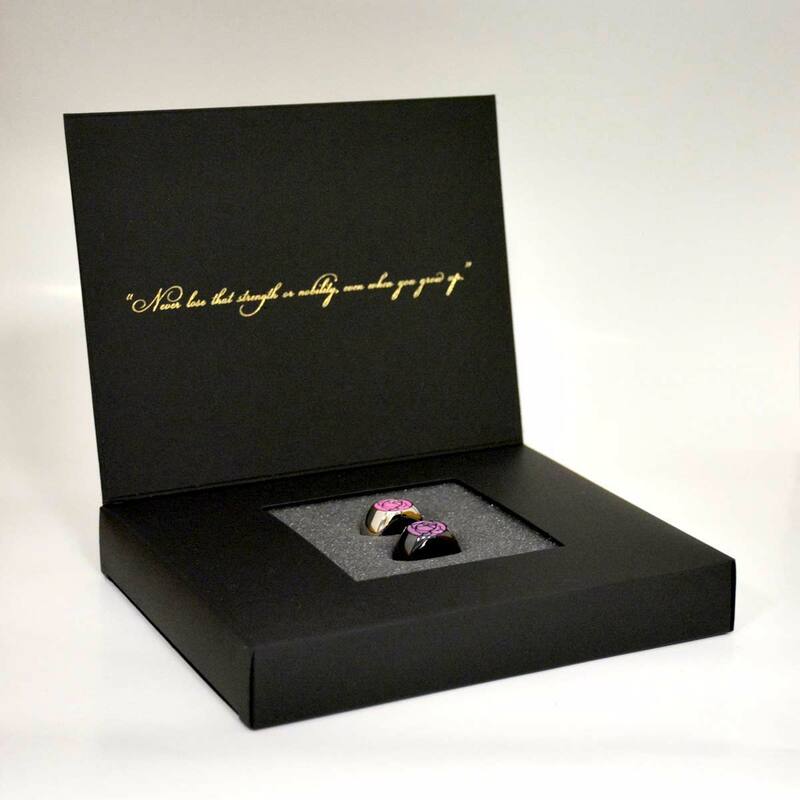 The texture of the box is a kind of velvety/soft touch and the artwork on it is georgeous. I agree with others that the cardboard sleeve is not going to hold up to wear but it is not really a selling point of the collection. For those who are curious I estimate the rings to be about a size 9 in American sizing, they are a little larger than my 8.5 at any rate. Both rings are nice quality. The artbook is a really nice collection as well. Ultimately if you are a fan of the series this set is a must have. Great product for a great price. The material used is great, the rings are a tad big but fit fine on one of my fingers. The art book is fantastic! With a lot of great commentary in it, and Utena is as always an awesome anime to watch. 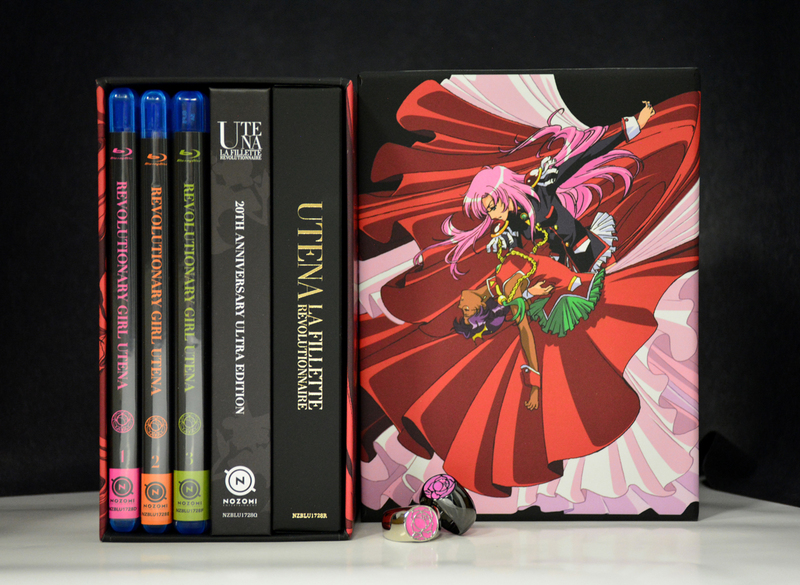 If you're interested in Utena and you're considering buying this, I'd say go for it. It came in so well and looked so nice I was so scared to open it! Its remastered from the anime in 1997 which was shot on 16mm film. 4:3 aspect ratio. I was a little disappointed when it didn't have widescreen. The original didn't have widescreen, so it required pillarboxes on my HDTV. Also, my blu-ray case containing the student council saga has the bottom hinge broken so I can't close it at the lower half. Its not a deal breaker, but it came shipped like this. No issue with the other blu-ray cases in the set. The artbook has concept art, limited edition number print on the front and it has commentary from the director Kunihiko Ikuhara on each episode and interview from the staff and more. The movie is pretty good, but due to size limit, it has a lower video bitrate compared to the anime. 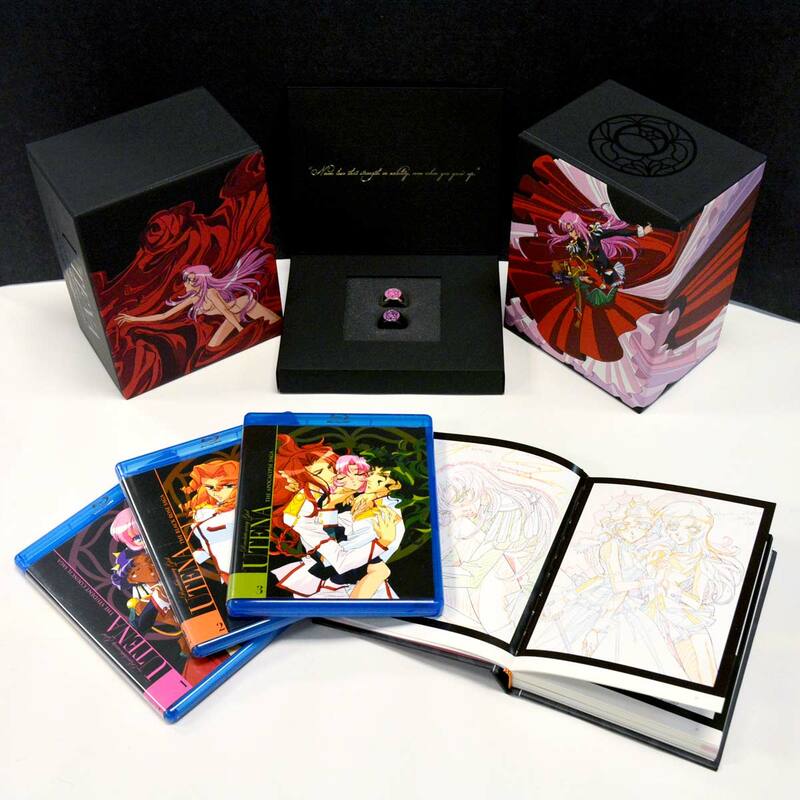 A lot of work went into this 20th anniversary box set and it shows. From the artbook, to the rings and the series on blu-ray. The artwork on the outer case is eye-catching. Anyone who loved the series should get this. 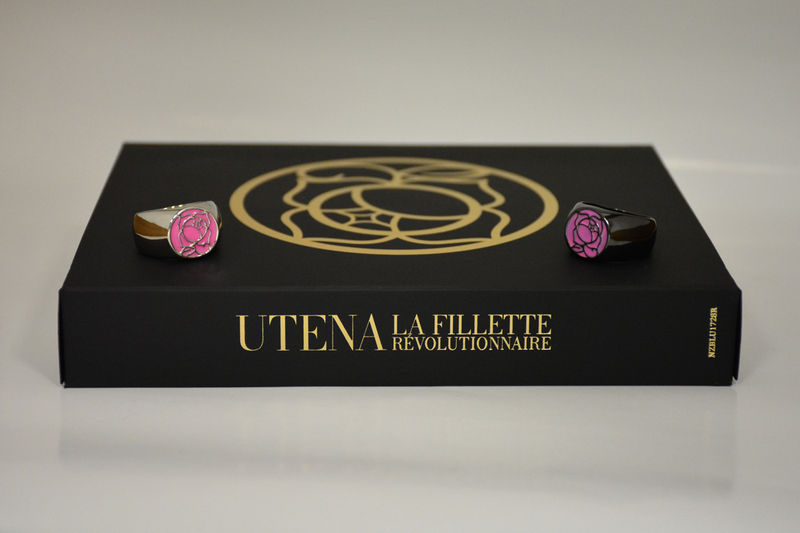 Great buy if you love Revolutionary Girl Utena. The packaging for the item made sure that there was no damage to it. Came with everything that was promised. The rings look amazing and so does the art book inside the box.